Is dropping strokes off your game one of the benefits of using an indoor putting mat? Many golf pros believe that it is. That must be why we sell so many of them at Watersavers Turf, a leading supplier of synthetic turf products. Practice has always been the key to better putting. So making it easier for people to practice is surely one of the benefits of using an indoor putting mat at home. It allows even the busiest adults to practice at times that work for them. They don’t have to drive anywhere or schedule a time in advance. They just have to practice for a half hour each day to gain the benefits of using an indoor putting mat. So what are the benefits that you’ll get from purchasing a synthetic turf mat? You’ll practice more often. Whether you keep your mat at your home or office, if you see it you’ll use it. You’ll be able to take a few strokes whenever you have the time or need a little break. It’s a great way to improve your short game. Being able to make straight and smooth putts will boost your confidence. You’ll enjoy your golf game more knowing that you can rely on your putting skills. As every pro will tell you, that’s something that only comes from lots of practice. Golf putting mats provide you with a great way to practice your golf skills any time you want to. They can also serve another purpose. They can serve as a way to ease someone into golf. 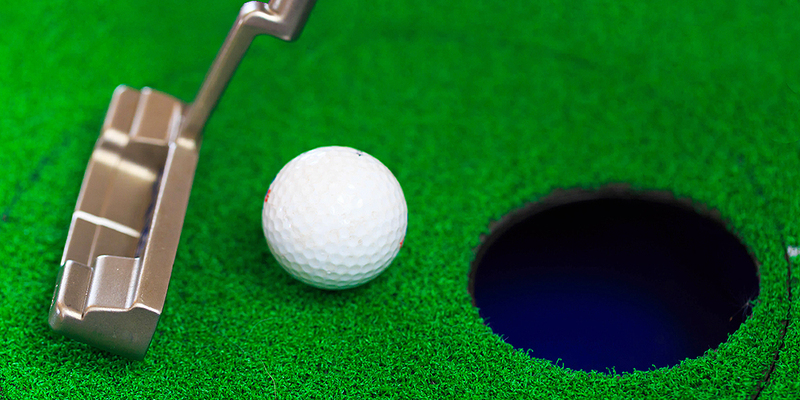 Using golf putting mats is a stress-free way for newcomers to learn how to putt. Anyone, from young to old, can learn the basics of how to put this way. It is one of the standard skills of golf that does not require a lot of energy. All that’s needed is a putter, some practice balls and golf putting mats that have cups in them. Even the most seasoned golfers, pros, and amateurs alike need to practice to stay on top of their games. However, they are savvy about how they get this done. They know if they want to practice with someone or if it’s better for them to go it alone. They work on every aspect of their games, such as driving and chipping. For putting, they often use both outdoor greens and indoor mats. It’s easier to improve your putting skills because you don’t have to be on a practice range or golf course. You just need to get yourself a good quality indoor green and then put in the time. Want to know how to get the best indoor putting green? It’s going right to the source for today’s best choices in artificial turf. At Watersavers Turf, we don’t just sell our quality turf products to homeowners, schools and business owners. We sell products like our best indoor putting green and other golf accessories to people who simply love the game of golf. Check out our online catalogue, where you will find specialty man-made turfs for a variety of sports including golf. You’ll see how easy it is to get the best indoor putting green from us. That’s not all. You’ll also see how easy it can be to have your own outdoor putting green in your yard. Many people have been doing this, so we offer all of the finishing touches. We have flags, cups and anything else you’d like to add to your outdoor practice green. Our synthetic grass experts can easily make this dream come true for you. We can also explain to you why the specific type of man-made turf you use is so important. Our experts can help you with choosing the right artificial sports turf for the use that you have in mind. Because we carry so many varieties, it helps to have an expert guide you through what each type offers. Even if you are only looking for an indoor putting mat, the type of grass you choose matters. We can explain which turf might work best for you and why. We also provide athletic sports turf options that are used for much larger venues. You can view them close up at our online turf gallery. The durability of our athletic sports turf makes it the perfect choice for putting greens and golf courses. It also makes it a great choice for soccer and football fields, batting cages, and more. Our products drain quickly and maintain their color throughout years of active use. We even back our quality with our 18-year residential (10-year commercial) product warranty. It’s one of the best warranties in the business. Just tell us what your turf usage will be, and we are sure that we can help you. With more than 60 types of the best synthetic grass, Watersavers Turf has become one of California’s premier sources for man-made turf. Large 1’ x 1’ free samples of all our varieties are available at each of our SF Bay Area locations. Stop by, and we will be very glad to help you. You can also call us at 844-974-8873 with any your questions on how to get the best synthetic grass for your needs. If you prefer, you can use our website to chat with us online 24/7. We always provide free estimates and can ship our turf products anywhere in the US. For professional contractors, we offer free installation training and other exclusive benefits. So for the best service along with the best synthetic grass, Watersavers Turf has you covered. Spend less time working in your yard and more time playing in it with man-made turf.